on November 15, 2018, 12:02 p.m.
Malaysians are split on the third national car project set out by Prime Minister Tun Dr Mahathir Mohamad, new data from YouGov shows. The research shows that almost four of ten (38%) Malaysians support the proposed new national car initiative which is mooted to launch by 2020. One in four (25%) oppose the project while the remainder (37%) are unsure. The government believes the plans could revitalise the Malaysian car industry. YouGov’s data finds that lower earning Malaysians are more likely than those on higher incomes to support the project. While three in ten (29%) Malaysians earning RM10,000 or more are in favour of the plan, this figure rises to 46% among those with an income of RM 1,999 or less. Furthermore, Malaysian Malays and Malaysian Indians (44%) are also more supportive of the project than Malaysian Chinese (24%). The research shows that the two current state-run Malaysian car brands – Perodua and Proton – both enjoy high levels of public recognition. 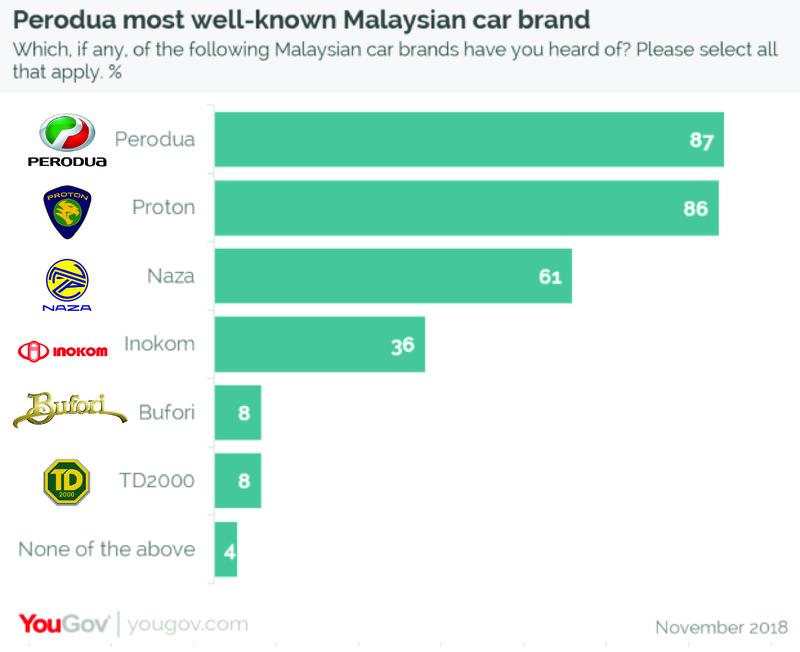 Perodua is the most well known, with approaching nine in ten (87%) Malaysians being aware of the brand, closely followed by Proton (86%). Privately-owned Naza is the third most well-known (61%), followed by less recognised local car brands Inokom (36%), Bufori (8%), and TD2000 (8%). Eight in ten (81%) Malaysian car-owners have a Malaysian-built vehicle, with Perodua being the most popular (49%), followed by Proton (42%). We asked what would encourage Malaysians to purchase a Malaysian car. Of the twelve factors listed, the thing most likely to encourage them to buy a Malaysian car would be for them to be available at a better price (75%). This is followed by lower maintenance costs (65%) and the greater availability of spare parts (48%). Other factors taken in consideration when buying a Malaysian car include national pride / patriotism (24%) and better brand prestige (15%). It is also notable that while six of ten (59%) of Malaysians would consider buying a second-hand car, when it comes to purchasing a second-hand Malaysian car, the number drops to 46%.